"I created this illustrated map of Mexico as an ongoing map project that I have been working on. There are all kinds of amazing foods, lots of architecture and all kind of characters and cultural icons from mariachis to sugar skulls." 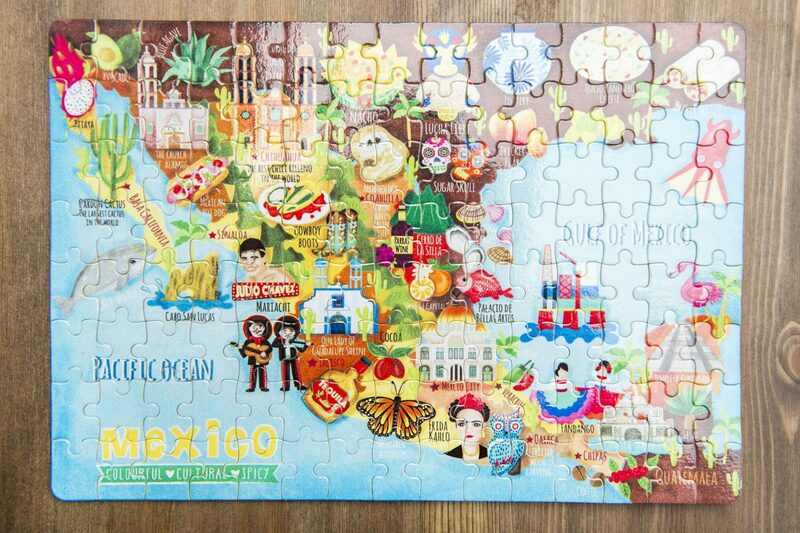 This is a jigsaw puzzle version of my Mexico map illustration. This is slightly different to most jigsaws as the corners are rounded but you can see throughout the photos very clearly what the jigsaw looks like. The jigsaw comes in a small tin box and it’s perfect for a gift. It’s good fun for both kids and grown ups who love jigsaws. It contains 120 pieces and the completed map jigsaw is a little bit smaller than A4.